Feelin’ hot, hot, hot! Try some frozen grapes. Don’t they look refreshing? When I find grapes on sale (which is rare lately! ), I flash freeze them on a baking tray and then store them in a gallon size baggie. 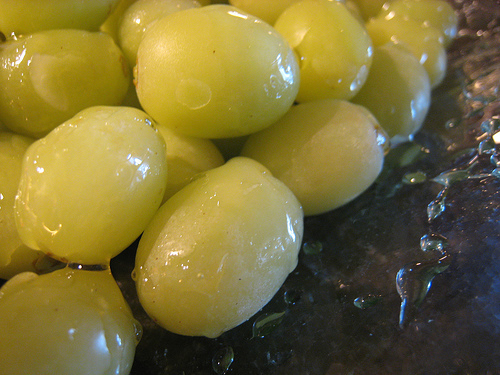 Frozen grapes are a perfect treat on a hot day. They are cooling and revitalizing. The kids love them. Just be aware that one could easily choke on these mini popsicles. Cut them up for younger children. You may also enjoy Chocolate Frosted Rice Krispie Treats. This post is part of My Meatless Mondays. Hi there! Following you over from Money Saving Mom. I am diggin your blog!